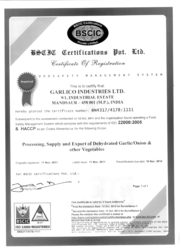 Established in the year 1978, we, "Garlico Industries Ltd." are ISO 22000:2005 and HACCP certified manufacturers, suppliers, traders and exporters of a vast assemblage of offering Dehydrated Vegetable Powder and Flakes. With prime focus on Dehydrated Garlic Flake, Dehydrated Cabbage Flake, Dehydrated Carrot Flakes, Dehydrated Green Chilly Powder, Dehydrated White Onion Powder, Potato Powder, Dehydrated Ginger Powder and Spinach Leaves, our company ensures that the range is grown with utmost care under strict supervision of professionals and offer perfect flavors and optimum freshness. At our end, the processing is done, under controlled temperature & environmental conditions and in accordance with the predefined Food and Drug Administration regulations. Proffered range of powder is massively used in preparing food items, in multiple cuisines and moreover, finds a vast application in homes, restaurants and hotels as well. Our optimum quality range is proffered in standardized packaging, at economical rates. We have an experienced team, which analyses quality of our products during the entire production process. Our products are widely appreciated by our client for their unmatched quality and unbeatable price. As a result, we have garnered ITC Ltd., Indo Nissin Foods Ltd. and Haldiram Snacks, Noida as our major customers. Furthermore, we have captured the markets of Japan, Australia, South Africa, Europe, Germany and Brazil, for exporting the range. We have achieved eminence in the industry by enhancing our operational efficiency and producing a quality enabled range for meeting the bulk requirements of our clients. This has enabled us to cater to overseas clients and maintain long-term associations with them. In addition to the quality-checked compilation, standardized packaging, we offer flexible payment modes for the ease of our customers. We use latest technology in processing of our products, and ensure the timely delivery to our client. Under the guidance of our mentor, Mr. Amit Garg, we have earned a strong reputation in the business, which we aim to maintain in the upcoming years as well. Manufacturing and Trading of Garlic Powder and Dehydrated Garlic Products. We have achieved eminence in the industry by enhancing our operational efficiency and producing a quality enabled range of Dehydrated Vegetables and Products to meet the bulk requirements of our clients. This has enabled us to cater to overseas clients and foster long term associations with them. We have highly professional team, this team is responsible for quality of our products. Our team of professionals is seasoned in their functional areas and holds all the requisite knowledge about production and packaging of Dehydrated Vegetables and Products. Our experienced team helps us produce the most qualitative vegetables and other edible products and ensure a longer shelf life by effective packaging procedures. Our quality personnel supervise all our operations including procurement of raw material such as seeds and plants along with manure and fertilizers.